From Honolulu Airport: Total driving time to Makai Ocean Engineering will be about 30 to 45 minutes. To exit from the airport onto the freeway, it is easier to first pass in front of the main airport terminal. At the outgoing (southeast) end of the terminal is an on-ramp for the H-1 freeway. The on-ramp splits, take the right side heading east, towards Honolulu. Once on the freeway, get over toward the left lanes, taking the lanes marked Honolulu, East. (You do not want the lanes marked Middle Street, Waikiki, Dillingham or Nimitz.). Stay on this road until you get to our office.The road will get progressively smaller over the next 20 miles and the name will change. Once you see two nearby islands, you are close and the pier which is just off to the right. From Waikiki: Most hotels on the island are in Waikiki. 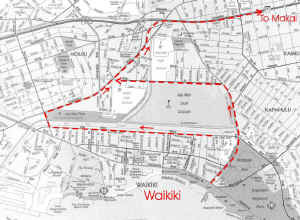 Note that there are two main one-way roads in Waikiki. Kalakaua Avenue goes to the SE and the Ala Wai Blvd. goes to the NW. You can exit on either one. Total driving time will be from 30 to 40 minutes to Makai Ocean Engineering. If you leave Waikiki using Kalakaua Ave., turn left onto Kapahulu Avenue past the zoo and then turn left onto Date Street (the third traffic light). At the next main intersection, turn a sharp right onto Kapiolani Blvd. A very short distance up is a traffic light and on the left is an East-Bound entrance ramp onto the H-1 freeway. Take H-1 East to get to our offices. The road will get progressively smaller over the next 20 miles and the name will change. Once you see two nearby islands, you are close and the pier which is just off to the right. If you leave Waikiki using Ala Wai Blvd, proceed to McCully St. where you make a right turn, crossing the canal. Go one short block and then turn right again onto Kapiolani. A short distance up is a light and on the left is an East-Bound entrance ramp onto the H-1 freeway. Take H-1 East to get to our offices. The road will get progressively smaller over the next 20 miles and the name will change. Once you see two nearby islands, you are close and the pier is just off to the right.